Item number Ia257 from the MOA: University of British Columbia. 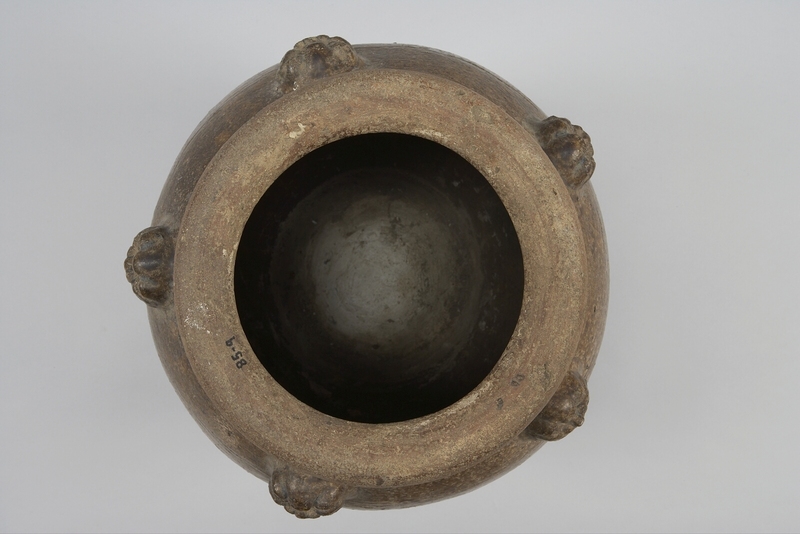 A large globular jar with wide mouth, thick overhanging lip and five lugs in the shape of lion heads. The main body motif is a pair of incised dragons each chasing a round object and bordered by wave patterns. The interior, mouth and underside are unglazed. The underside has a thick layer of white plaster. A set of inked numbers on lip. In many indigenous groups of the Philippines, supernatural power was attributed to Chinese ceramics because of the ringing sound emitted when lightly tapped and their vitreous, shiny glazed surfaces which impart an impermeable quality. The ringing sound was seen as a magical voice able to attract the attention of powerful ancestor spirits. Their impermeable and seemingly imperishable surfaces were believed to have great protective power against all kinds of influences, from evil spirits to poisons (Langrick, p. 55-56). While the dragon is a traditional Chinese symbol embodying the yang or male principle and emblematic of good fortune, it is also associated with the mythical Naga serpent by the peoples of Southeast Asia. Dragons frequently occur in pairs with each chasing a round object variously interpreted as sun, moon, pearl or the yin yang emblem. The lion is sacred in Buddhism and is an emblem of bravery and strength. An heirloom piece defined by Dr. Tecson as a piece never in the ground, thus different from an excavated piece, and not necessarily from his family. 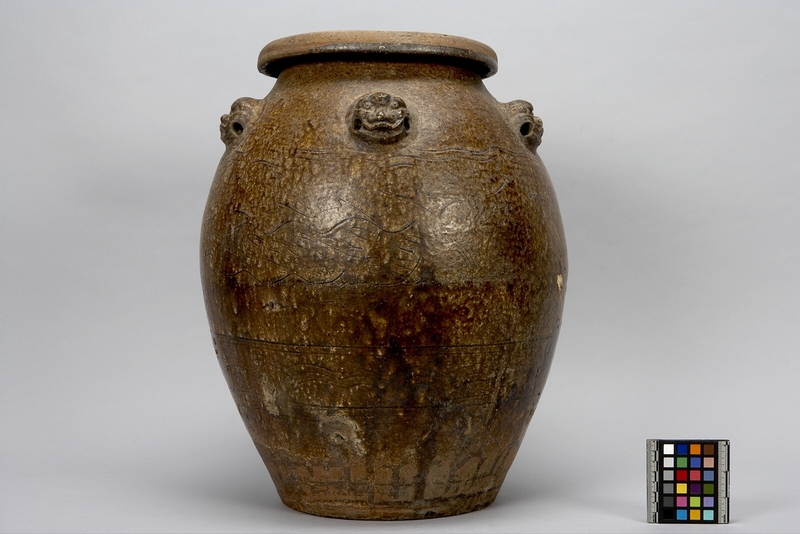 This jar is from Zamboanga del Sur, Mindanao Island.